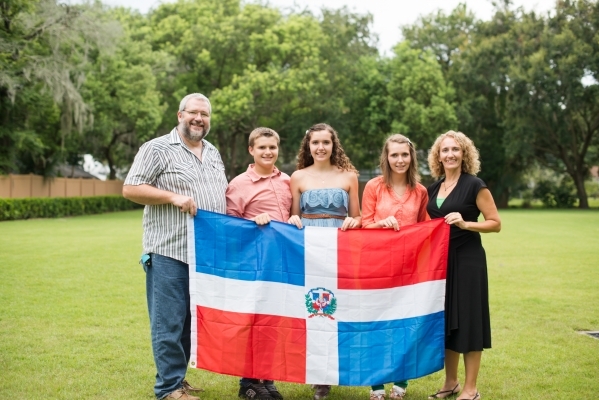 Home is now Santiago, Dominican Republic! August 27, 2013 was our arrival day! The Walker Family officially lives in Santiago now. We are working on staff with YWAM Santiago. Before we joined staff, YWAM Santiago consisted of Glenn, Rhoda and Jason Martin and Issa Peralta. The Martin's are now currently out of the country until January 2014 at various conferences and their daughter is getting married. So YWAM Santiago is Issa and us. Issa is a beautiful young Dominican lady whom we first met in Fort Lauderdale in January of 2010. She has been left in charge with us helping her. The biggest thing we will be helping Issa with is SUYO. This program works with Dominican youth aged 9-16. There are around 20 SUYO participants that come once a month for the weekend. We will have teachings with them regarding discipleship and Christian life and then we will do a couple of local outreaches. We are transitioning well at this point. Mainly because we have been here before so we know how to get to the grocery and the local stores. We can communicate enough to get around. Asking where something is located is fairly easy, although understanding what the directions given to us is much harder! It is extremely strange to move somewhere so familiar yet still so foreign! Our family's biggest task is to learn Spanish!! 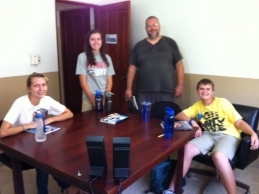 We are taking classes at ISLA, a local school with English classes. We have our own personalized class with the 5 of us. Our teacher, Guarionex, is a Christian and we start each class reading scripture. This is a blessing. We can't really pronounce his name correctly so we all call him Prof X. We all enjoy class because yes, it is work but he enjoys our family and we enjoy the time together! It is quite expensive but is it really one of the most important things that we can do to acclimate here. It is VERY important to include the STI 27519 in our address. Mail may be addressed to any member of the family. We can now receive mail through Agape Flights mail service. Letters and small packages around 1 lb come in for free. Anything over that we pay $1.75 per pound. Agape Flights suggests having the sender bless us by donating the $1.75 per pound or part of it to them on our behalf. Please email us for more information! Letters or small things from home would be greatly appreciated as we transition. Pilot Ray Oostdyk and the Walker Family! 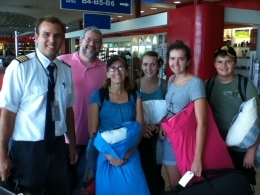 Our family was really blessed to get to fly into Santiago via MFI! Missionary Flights International is an organization that flies missionaries and cargo around the Caribbean. You can check out more information about them at Missionaryflights.org . We homeschooled with a lot of the workers there including the Oostdyk's while in Vero Beach. We flew on a DC-3 plane next to the cargo! It was pretty neat. Yes! Like you see in the movies! The rows were two seats wide with cargo, boxes, suitcases, etc...netted in next to us. We stopped in Exuma, Bahamas and refueled and then in Cap Haitien, Haiti to drop off and pick up some passengers. Then arrived here in Santiago, with 1/3 of our belongings. Due to the kind of aircraft, everything goes by weight and there was only enough room on the plane for us and an additional 650 lbs of cargo. On September 10, another 1/3 will arrive here and then two weeks later the last 1/3. Seems like a lot of weight til you start weighing clothes, shoes, books, legos, and all household items! So by the time we arrived in Santiago, we had been to 4 countries! Started in the United States, then the Bahamas, then Haiti and then the Dominican Republic! One of our responsibilities: NIKOland is a 4 acre piece of property up in the mountains just north of Santiago. It is about an hours drive up the mountain and is very rural with no electricity or running water. It is the campo! The purpose of NIKOland is to run NIKO camps, which are survival leadership camps for youth. Sammi in 2010 and Hannah in 2013 both completed this program and it greatly changed their lives. Jesse will be allowed to participate in 2014! He is quite excited because he will be an exception and do it at a younger age than most. NIKOland is also a place where youth or church groups can come and do leadership training weekends. Our first task as staff at YWAM Santiago was to help with one of these weekends. The leading Christian private school in the city and possibly the country had their Senior class leaders do this training. We were support staff and Debbie was in charge of cooking. Ned helped with this a lot as we were cooking outside over gas or on a bonfire. The kids got to help lead the night hike, which is quite the adventure in the dark. It was a blessing to be a part of this first leadership training weekend. * Language Learning! That we will be able to learn Spanish quickly. Also for the funds for the lessons. *Safety and Adjustment.. We are adjusting to life here which includes heat, noise, locks, alarms, etc... One can not just leave things lying on a table here such as a computer or a camera. This makes people see what you have and since you are Americano you are already viewed as rich. Petty theft is very bad and we must hide valuables constantly and hide the laptop etc... when we leave. It is always a bit nerve wracking when arriving home to see if we've been broken into or not. September 25 is Jesse's birthday! 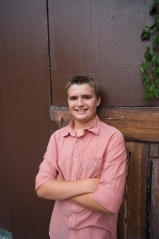 Can't believe my baby boy will be a teenager! That doesn't seem possible. He is really a sweet young man who is quick to serve others. He loves going to NIKOland to work hard. Physical labor is one of his favorite things to do. This morning we arrived at church earlier than Brauny, a boy whom we met on our last visit, and Brauny slipped in to sit next to Jesse. You could see the pleasure in Jesse's eyes of having a friend! Brauny speaks English which is a relief to Jesse. They really connected last time when we were here when they learned that they share the same birthday. Brauny is a good Christian boy who serves his mother well. It is neat to see how God is providing a friend for Jesse.